As a community we enjoy the presence of the Servers Community at every liturgical celebration. We are really blessed by their presence. 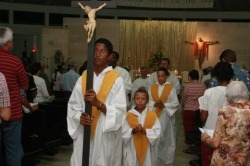 We have altar servers of different ages and gender. The youngest is 7 years old and our senior servers are already mothers and fathers. Traditionally, our servers belong to the St. Stephen’s Guild. The special certificate was issued by the Archbishop of Westminster on September 3, 1982. The Servers have practices and training but the most exciting is the night before the Easter Vigil when they keep the guard and sleep in the church. If you would like to join the group please contact the office.